Like many women out there, I have a thing for peonies. 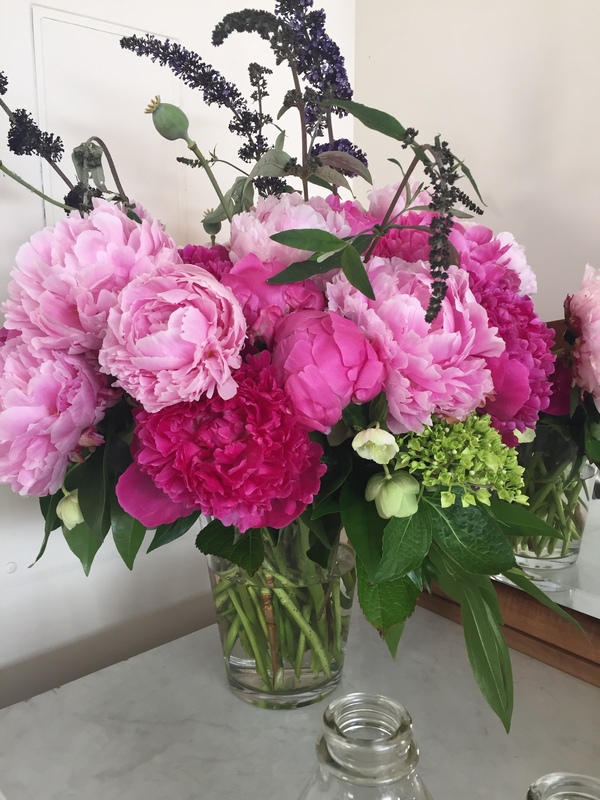 If roses had a fancy cousin, peonies would be it. Though short, I anticipate peony season every year, and unnecessarily pick up bouquets for myself at the local Trader Joes. Treat yourself! 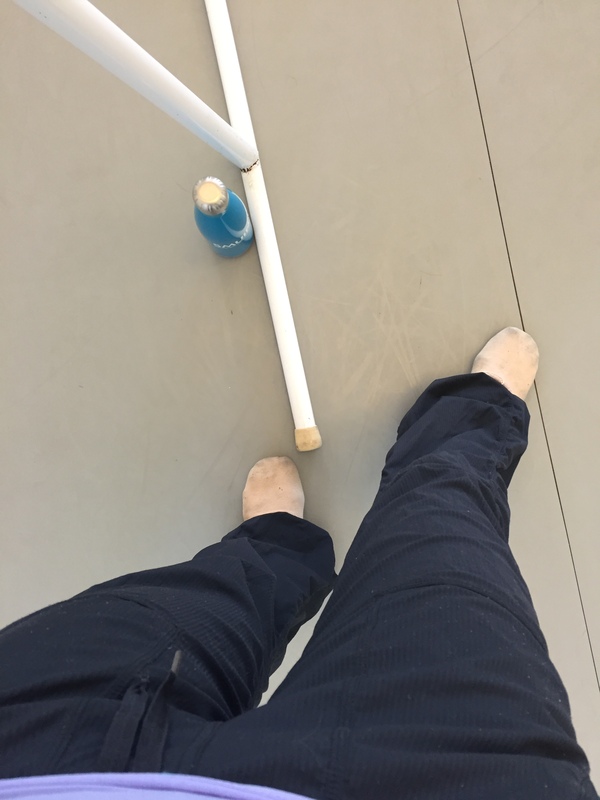 Ladies and gentlemen: I finally made it back to ballet class. I notice that my mood is never quite right without dancing on a regular basis, so I packed my things and bowed out of the office for a bit on Wednesday. Everything hurts and I’m having trouble walking up stairs, but it was worth it! I love that 20th Century Cafe (one of the most instagrammed resturants in San Francisco!) is so close to my office. 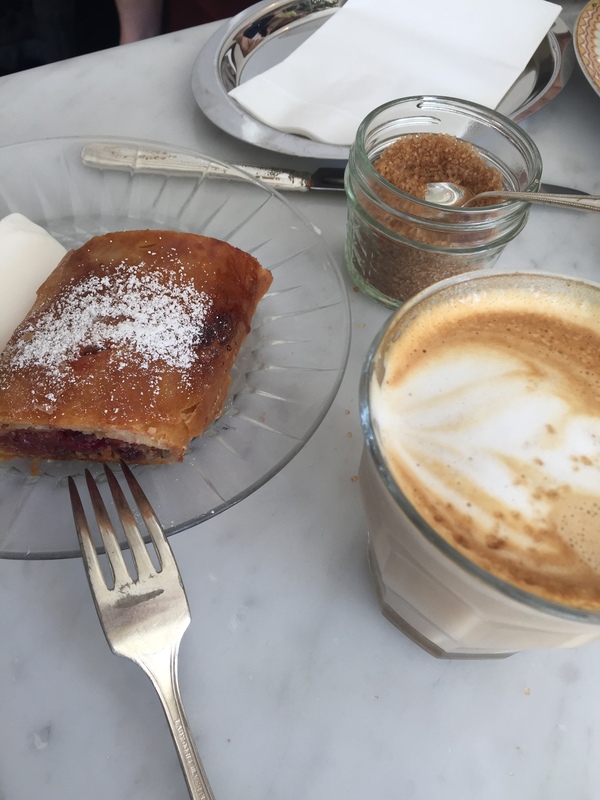 They have pastries I’ve only ever seen in Europe, and their strudel is almost as good as the one my Austrian grandmother makes. Almost. I like to have something to look forward to after a long workday. 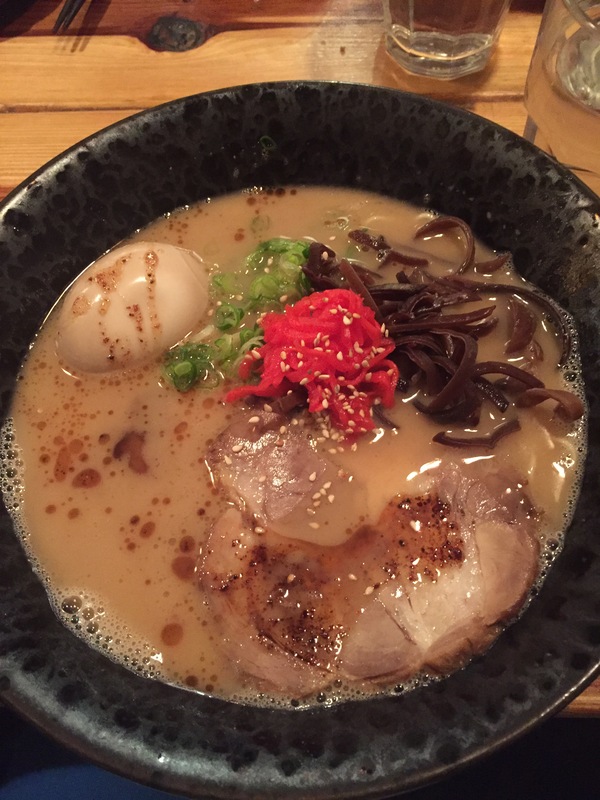 Last week, I met a few girlfriends of mine at Ken Ken Ramen in San Francisco for dinner. Now, I’m not too savvy when it comes to ramen, but this stuff was unlike anything else I’ve ever tasted. For a bowl of what is, in actuality, just soup, it was incredibly filling and rich! I’ll definitely be back. Did everyone have a good Memorial Day Weekend? Whenever anyone asked what I was up to, I couldn’t help but recall this stylish Anne Taintor luggage tag I found on Pinterest. This could have accurately described my weekend, but in a positive and relaxing way. I had no concrete plans and all the time in the world. It was really refreshing…although nothing can quite beat a vacation. Soon! My Five Things for the week are truly indicative of my life lately. Meaning, that my life has consisted of cold brew coffee/cocktails/coffee cocktails, inspirational Pinterest quotes, snarky T-shirts, and chocolate. In case you haven’t already noticed, I’m a horrible stereotype of a 20-something woman and need to be stopped. But, at the end of the day, at least I’m not accosting you with my crazy outfits from Coachella. You’re welcome. Prizefighter is quickly becoming one of my favorite East Bay bars. It has everything you might need: snacks, delicious cocktails, and puppies. I often come here over other spots just to play with stranger’s dogs. 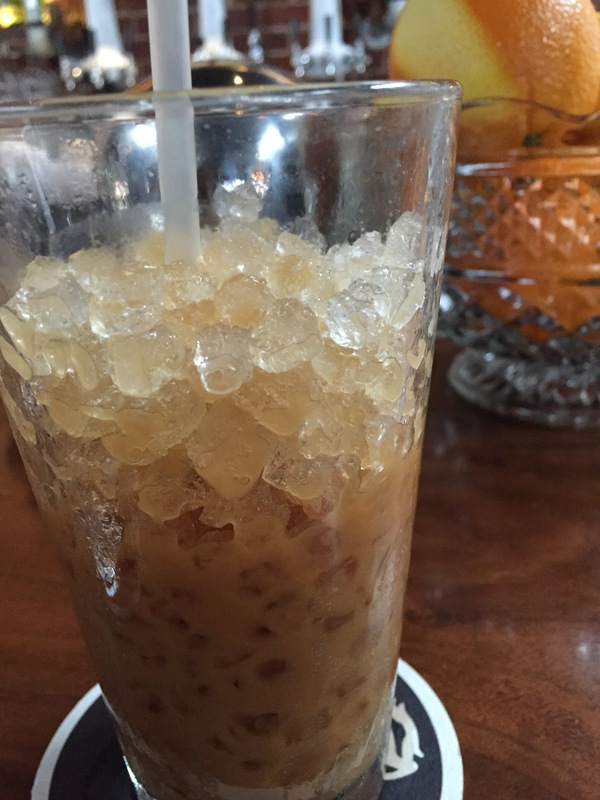 They do get bonus points for having a section of their menu dedicated to alcoholic iced coffees. Win! 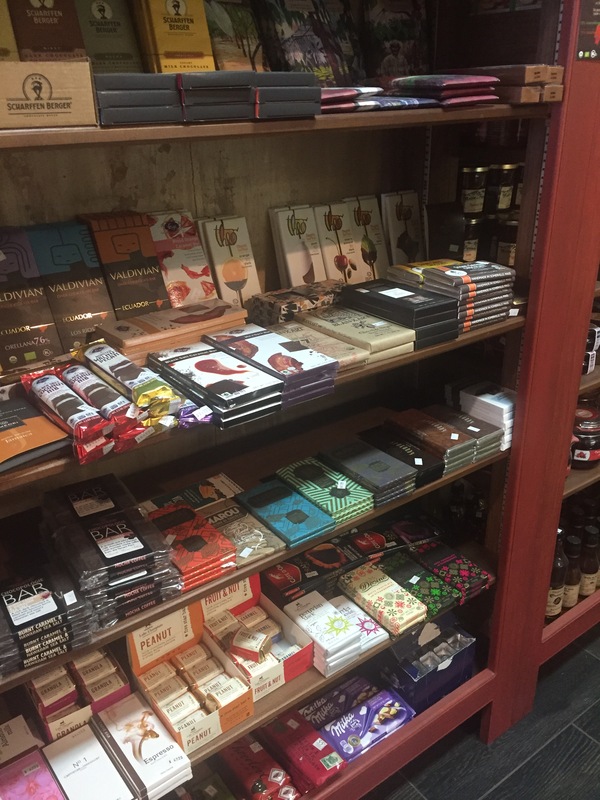 There’s the most wonderful little wine shop that sells European cheeses and chocolates. I like to stop by occasionally and grab lunch there while ogling all their treats. My friend Rachel recently introduced me to a marvelous new thing: Creme de Violette. 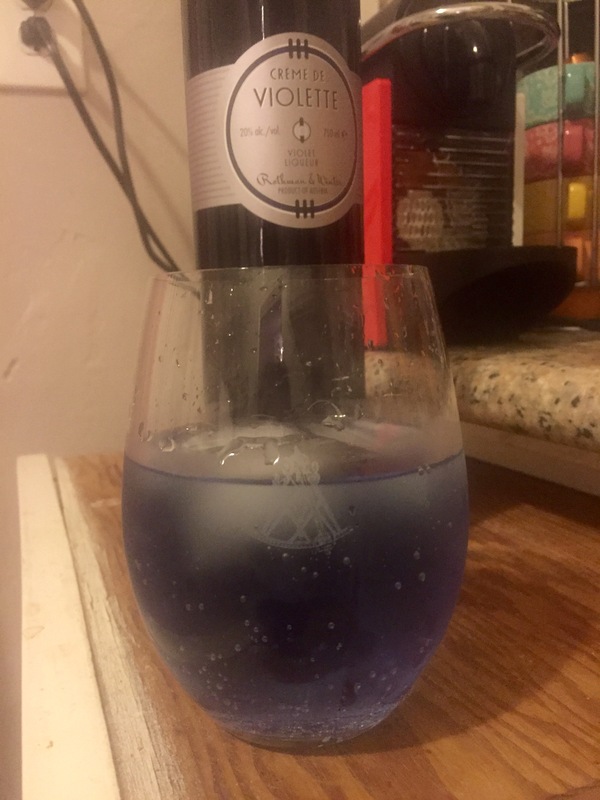 It makes your cocktails this beautiful violet color, and tastes amazing! I like it best in my gin and tonics. Sometimes I wish life could be this simple. Perhaps it’s just up to you! Go get yourself some ice cream and forget about those people, and, although violence is never the answer, I’m sure there are a few individuals out there who merit this quote. 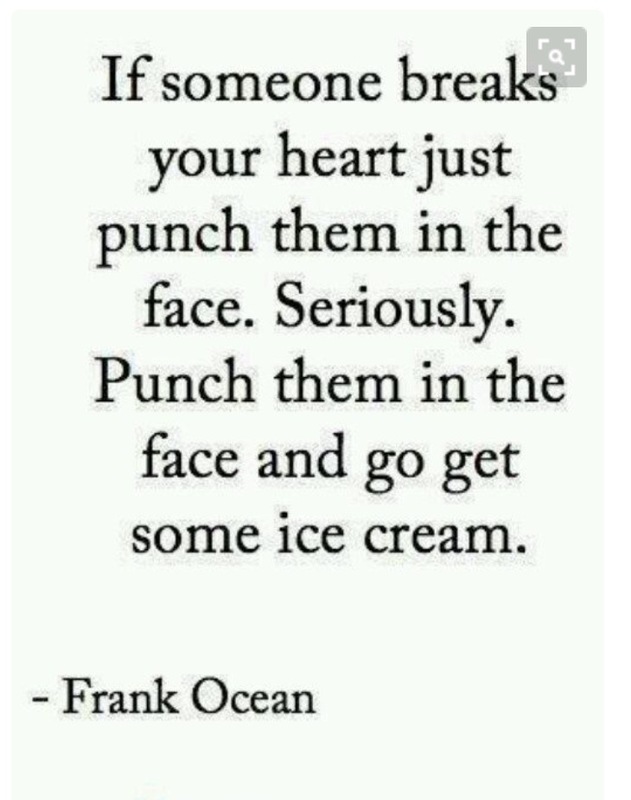 Thanks for the wisdom, Frank Ocean. 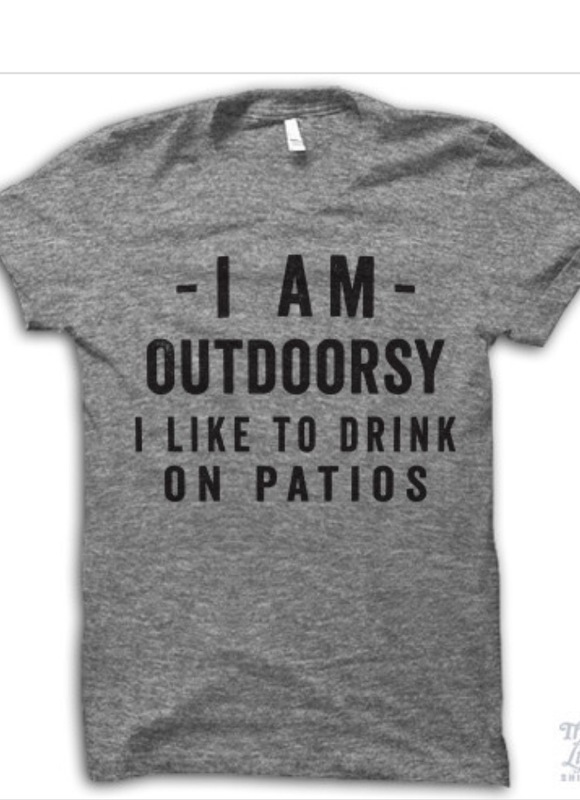 A friend recently showed me this t-shirt and pronounced that it was entirely me. I also like hiking, as long as I can wear my yoga pants and bring my traveling latte. I could spend a great deal of time perusing all of the tops at Thug Life Shirts– they’re all hilarious. I could never decide on just one. 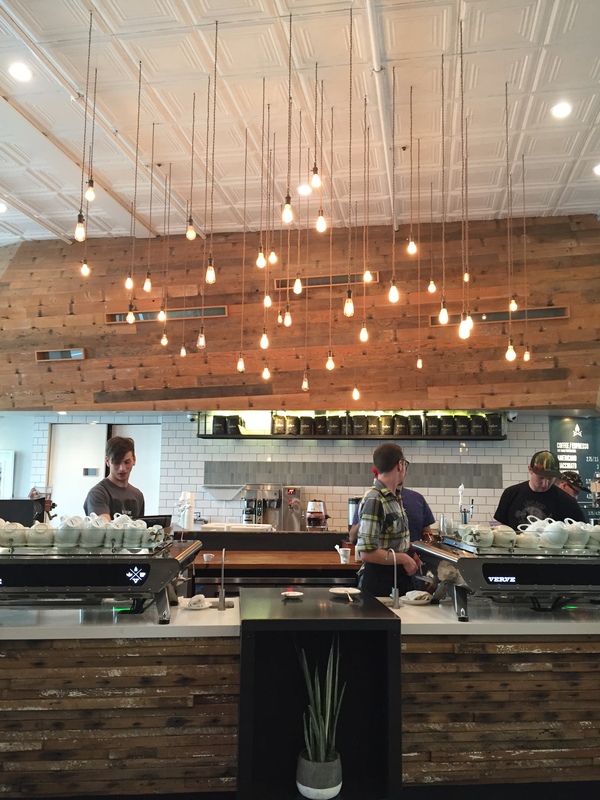 I’ve become oddly fascinated with the Trouble Coffee Co. in West Oakland. It’s such a unique spot, and I’ve determined that their cinnamon toast must have some sort of crack in it. It’s that good. I recently took a friend of mine there and he was fascinated by the how pristine and white the whole cafe was. A little disarming, but lovely nonetheless. The above outfit is brought to you by Athleta. Think you can only wear your yoga clothes to the gym? Think again! I popped this outfit on for work and fancy dinner, and was oh-so-comfortable. 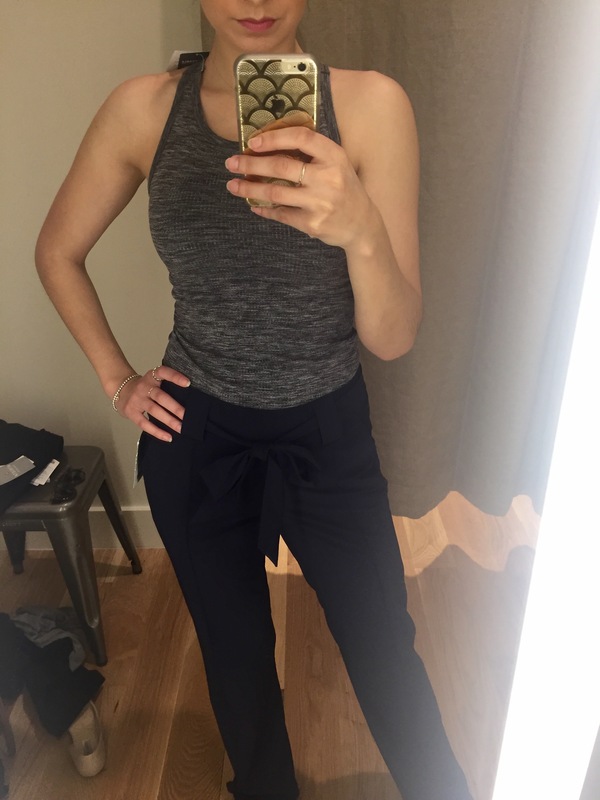 I’m loving their Destination Wide Leg Pants so much I might buy another pair. The boss lady and I have the occasional ritual of visiting our favorite pizza joint, Hot Italian, in Emeryville after a long day of work. 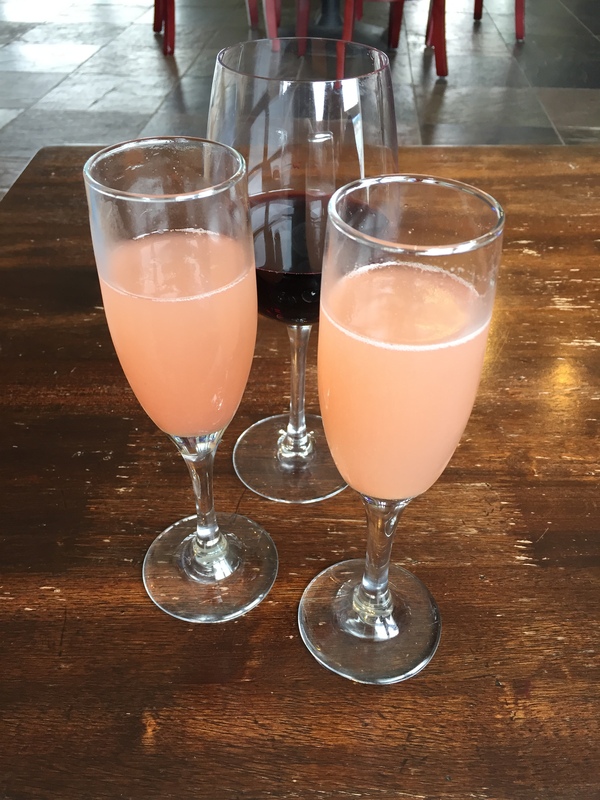 We always order their blood orange mimosas- they’re amazing! As some of you might already know, I have a bit of a dry shampoo dependence. 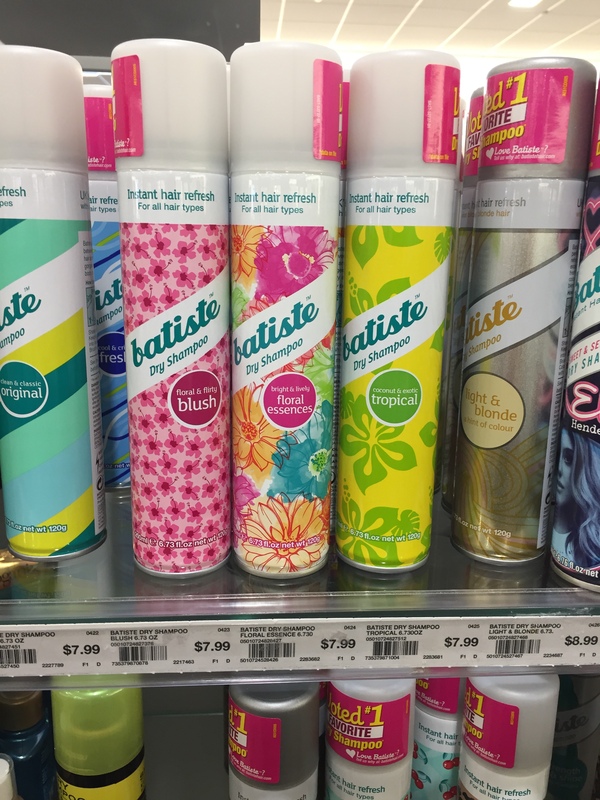 I’ve tried all kinds of brands, but my favorite has to be Batiste. They come in a great variety of fragrances (my favorite are the cherry and “wild” leopard print ones! ), and really do give your second-day-hair that necessary boost. 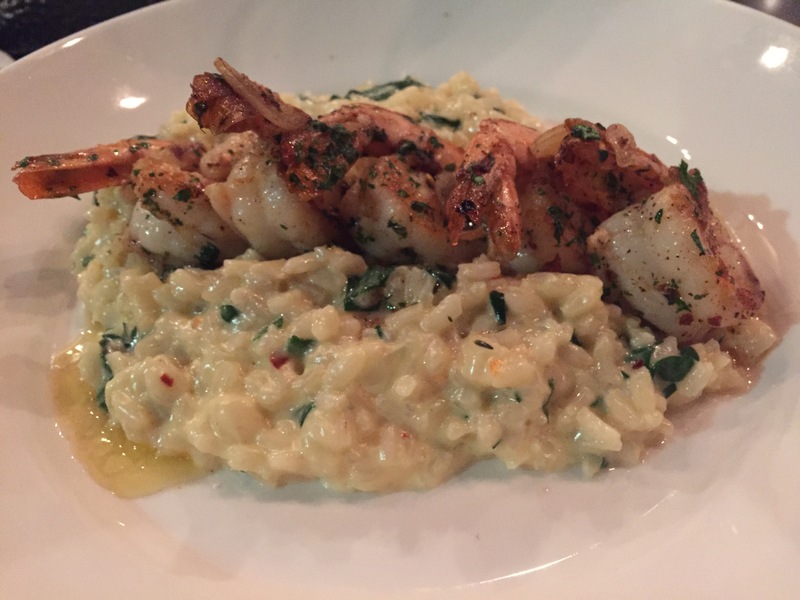 My final food snap of the week is of this amazing spinach and shrimp risotto from one of my favorite local restaurants. I’m pretending that the puddle on the far left is broth, as opposed to a puddle of butter. Yes, it was all delicious. The last two weeks have been interesting, to say the least. I feel like I’ve finally adjusted to whole “spring-forward” time debacle (who would have thought one hour would make that big of a difference?! ), but I have no idea where the entire month of March went. Anyone? Has anyone seen my March lying around? If so, please return it to its rightful owner. 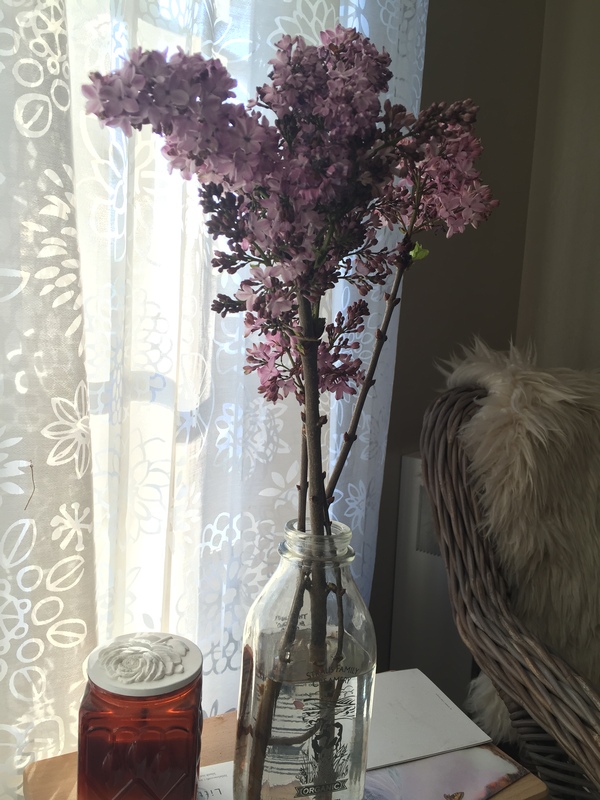 I absolutely love lilacs, but rarely allow myself to buy them during the few times I find them in season. This weekend was different, and I’m so glad I did! I’ve been on a horrible avocado toast kick as of late. I had the very same meal pictured several days in a row, something I almost never do. 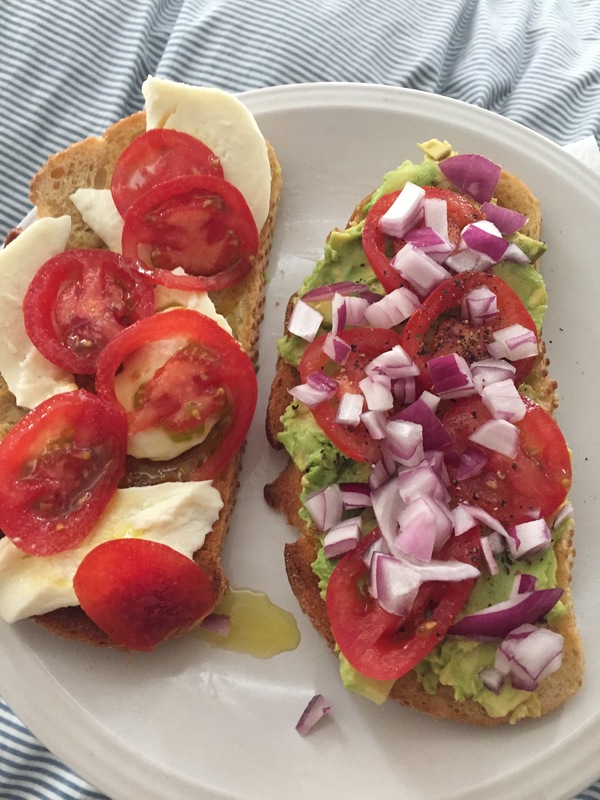 To keep things interesting, I like making toast with fresh mozzarella, sea salt, garlic olive oil, and tomatoes to accompany the avocado toast. One of my favorite spots in downtown Oakland has to be Make Westing. I love their garden gimlet cocktails with fresh mint, basil, and cucumbers. It’s like salad in a glass! I recently had the pleasure of attending the wedding of a former coworker of mine. The invite itself was intended for my mother, but due to a series of unfortunate events, I ended up going instead! 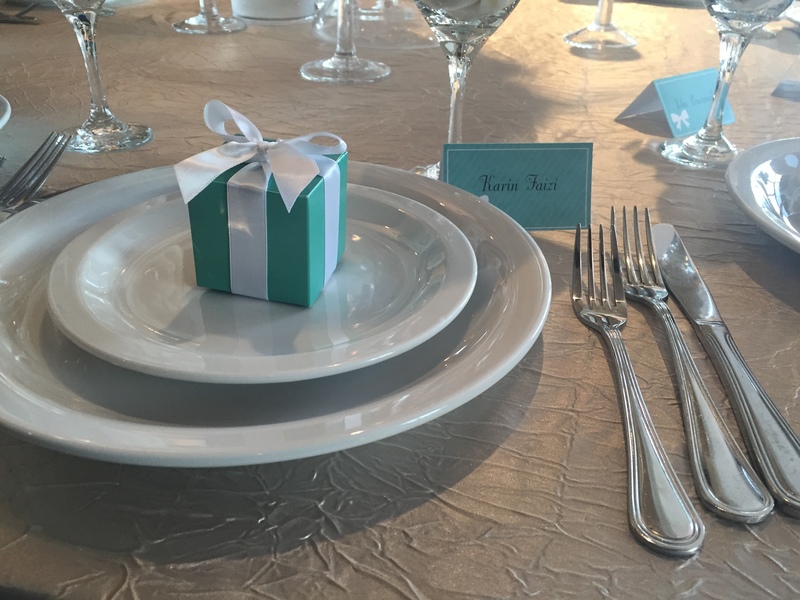 I loved the little Tiffany and Co. themed favors at each table, each filled with customized M & M’S. Very cute. 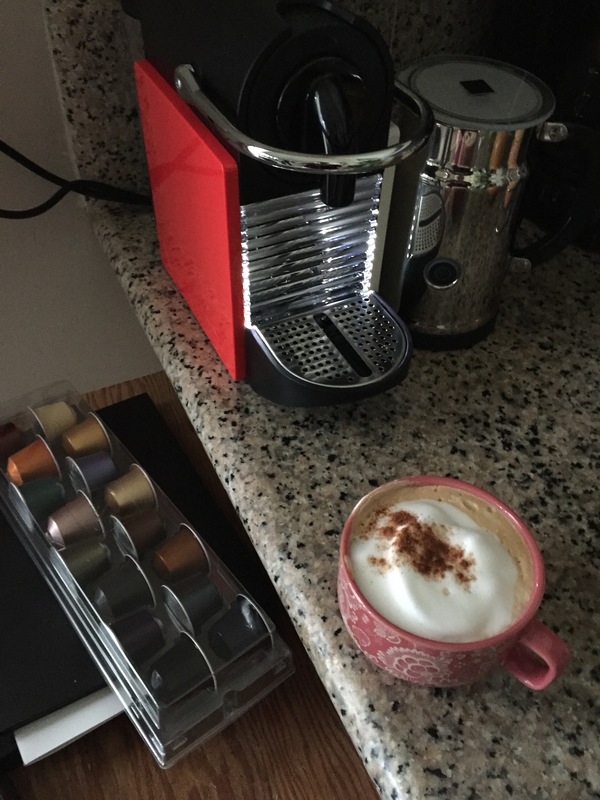 I absolutely love my Nespresso machine (read all about it here!). I got to take advantage of the “self-selection” vault the other day at the flagship location in San Francisco. 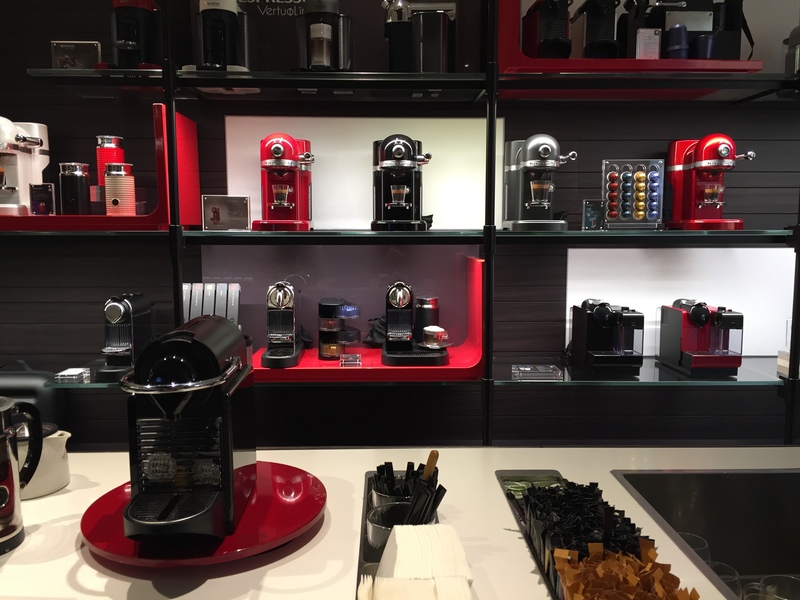 All I needed was my credit card and my Nespresso key-fob and I went wild! Helping yourself to all the different coffee selections can be quite fun. Let’s face it, it’s probably the only “exclusive club” I’ll belong to for a long while. 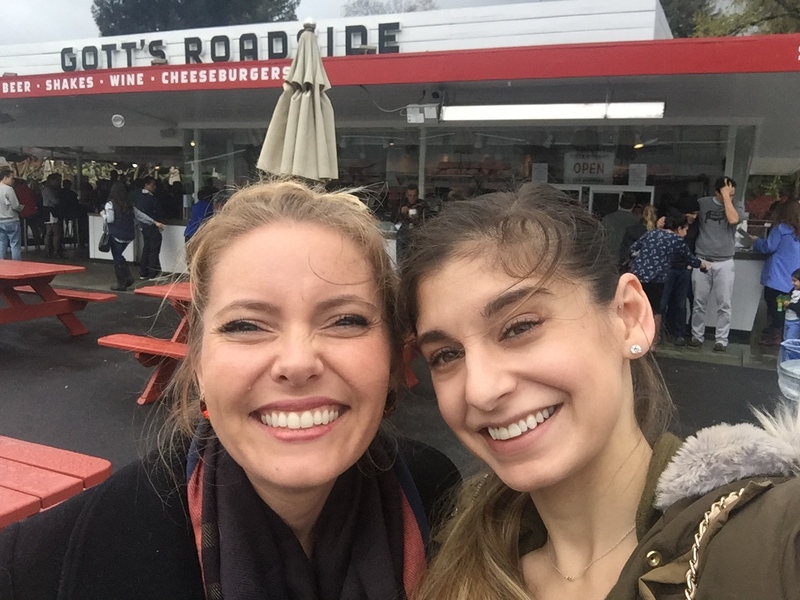 My friend Emily made a quick jaunt from her home in AZ to the Bay Area for work a while back, and I had the pleasure of spending the weekend with her. I wish I could say that the weather here behaved for my desert-dwelling friend but alas, that is not at all the case. However, I can’t remember the last weekend I did so many fun things! We certainly made the most of it. I tried…okay. My giant hand is in the shot, and such is life. 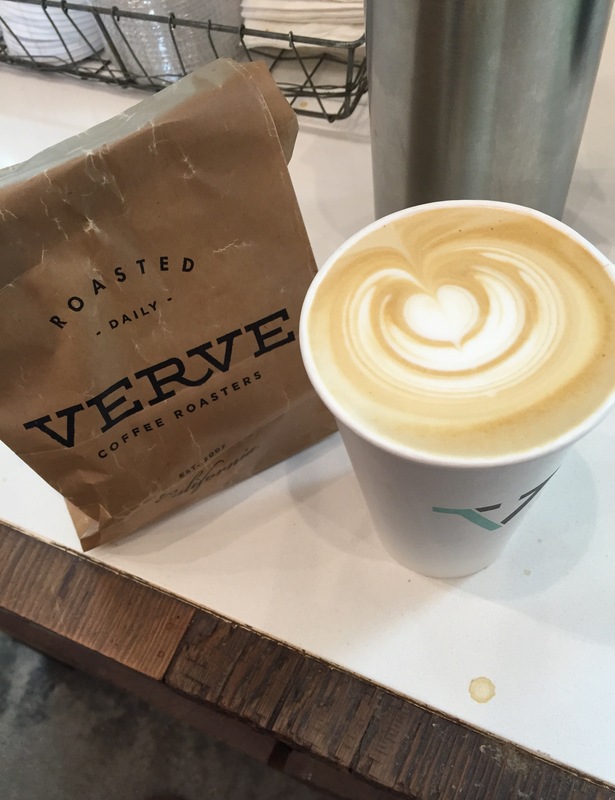 What matters is that we’re ecstatic about our coffee. Also, can we also take a minute and gawk at Emily’s vintage earrings. So sparkly! Windy, dreary, cold buckets o’rain. But, that didn’t stop us from having a good time! 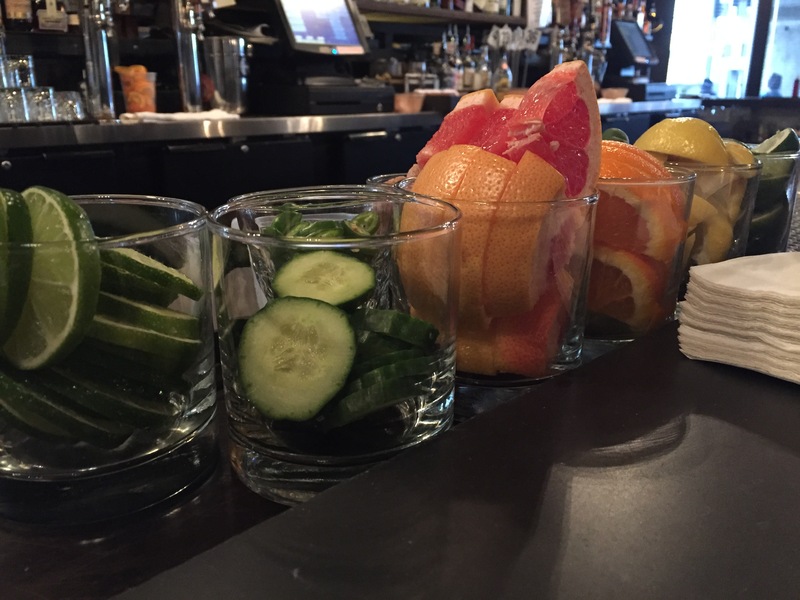 Friday’s itinerary involved delicious sushi and drinks at Prizefighter in Emeryville, where the rain let up enough for us to enjoy the patio and meet countless dogs. 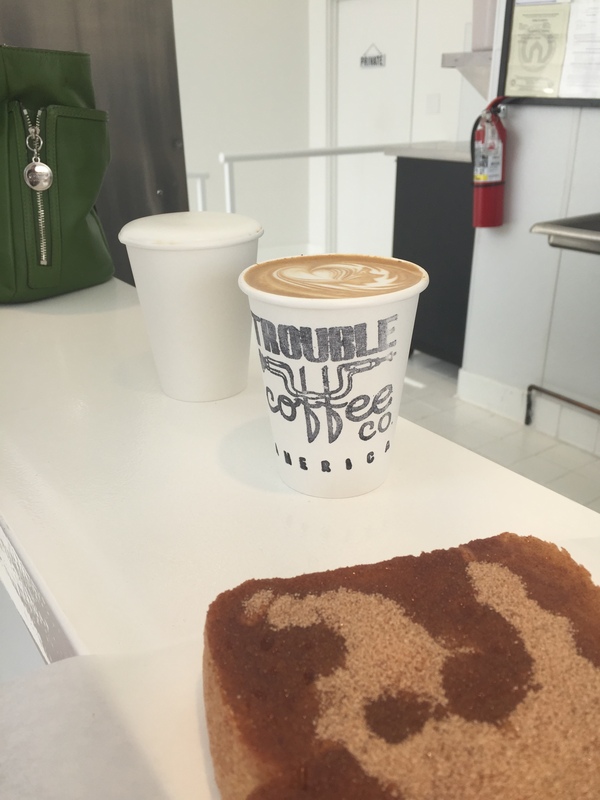 Saturday involved a pit stop at Trouble Coffee before popping on the freeway and heading to my favorite places in wine country. 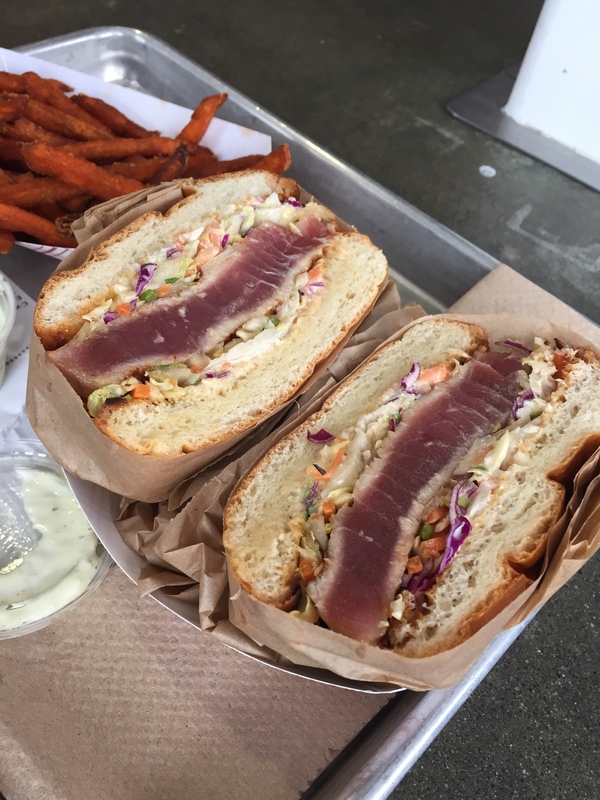 I finally got to sink my teeth into the ahi burger at Gott’s, albeit hiding from the rain with dozens of other people outside. We followed lunch up with some wine tasting at one of my new favorites in Yountville: Jessup cellars. 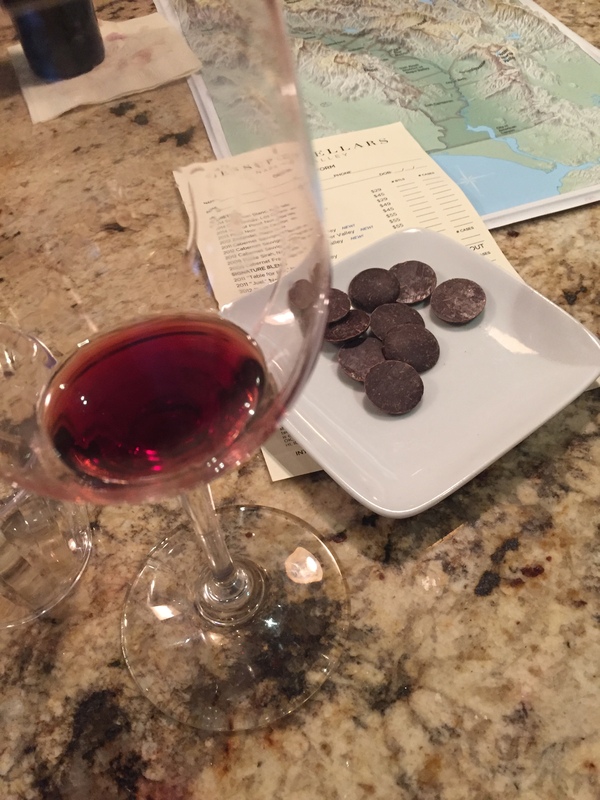 We almost walked away with a totally indulgent bottle of port- amazing when paired with disks of dark chocolate. I highly recommend checking them out, if you’re ever in the area! We ended the evening with drinks and dancing at Blondie’s in San Francisco’s Mission district, followed up by late-night tacos at Pancho Villa. 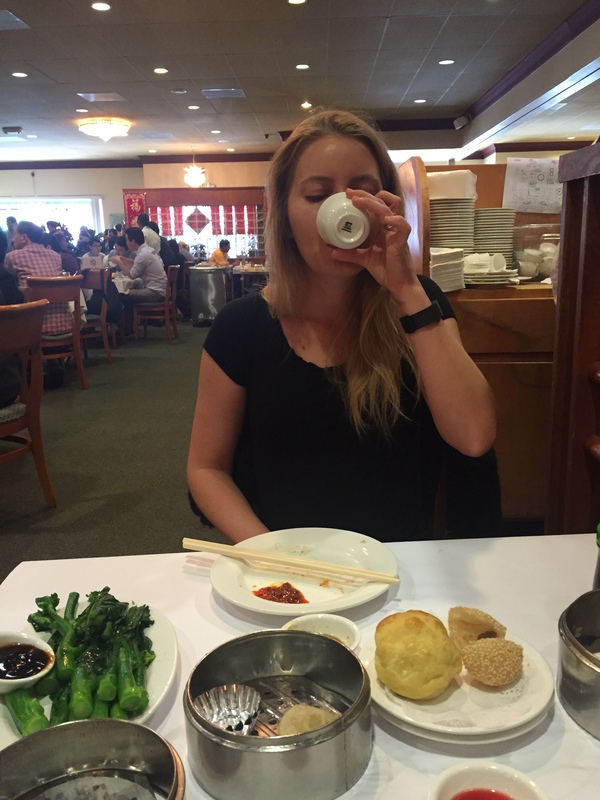 Emily was a good sport when I dragged her out of bed early the next morning to grab dim sum at a local spot. 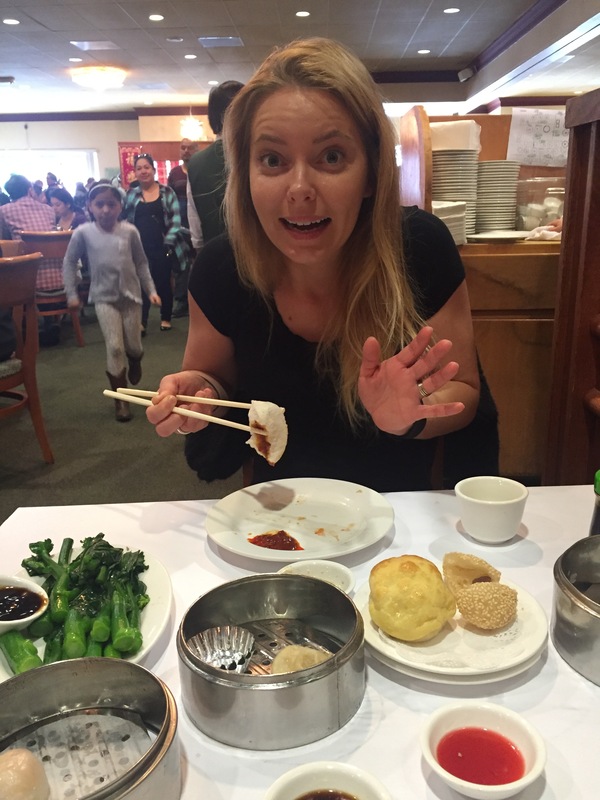 I would like to think that her first dim sum experience was worth the early morning. Look at that expression! That’s how I feel when I get up and get to eat egg custard buns too. 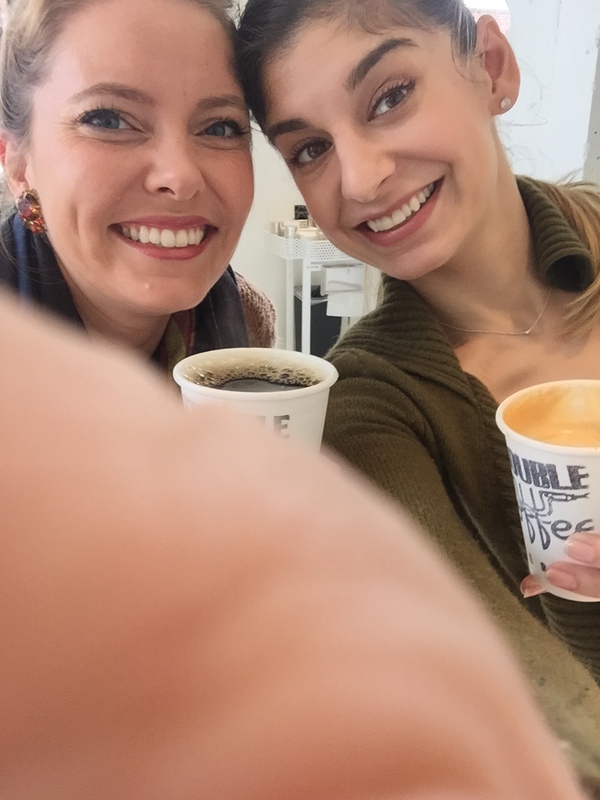 After eating, we zipped across town and got our nails done to start the next week off right. Many of us had the opportunity to enjoy our a long weekend this past Memorial Day. 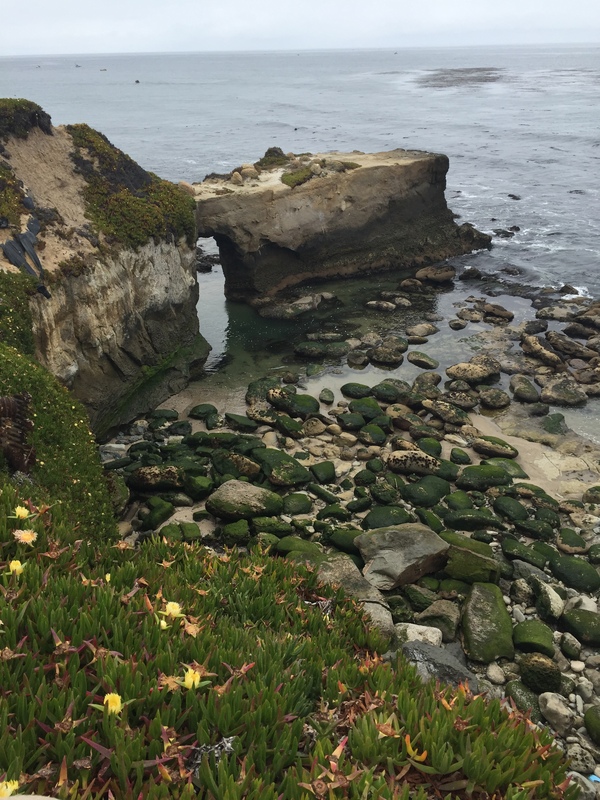 I initially planned on lying around my apartment in a semi-comatose state, but the opportunity for a quick getaway down the coast presented itself, and I couldn’t say no. 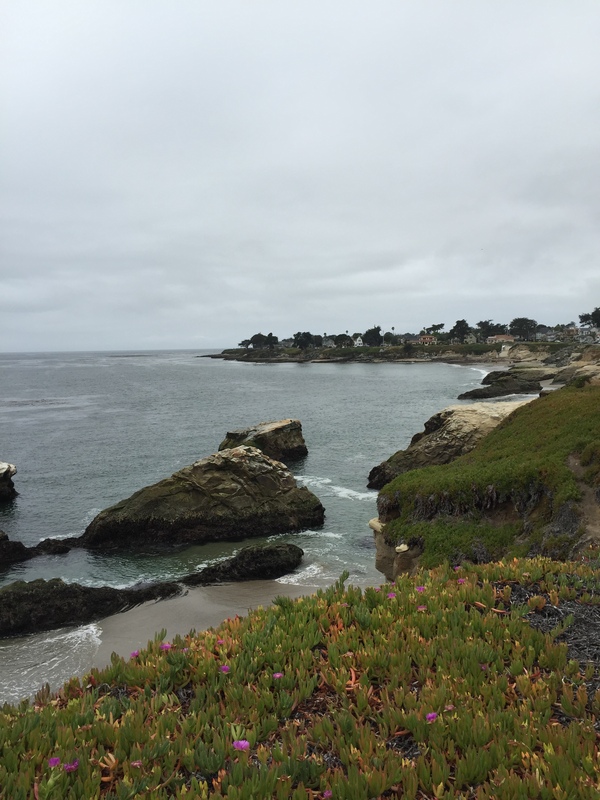 So, my girlfriends and I packed our bags and headed to Santa Cruz for a little beach vacation. Don’t get me wrong, I was still lying around an apartment, but this time it was beach/pool adjacent with either a glass of wine or a fantastic latte from the local Verve coffee in my hand. I had zero complaints. 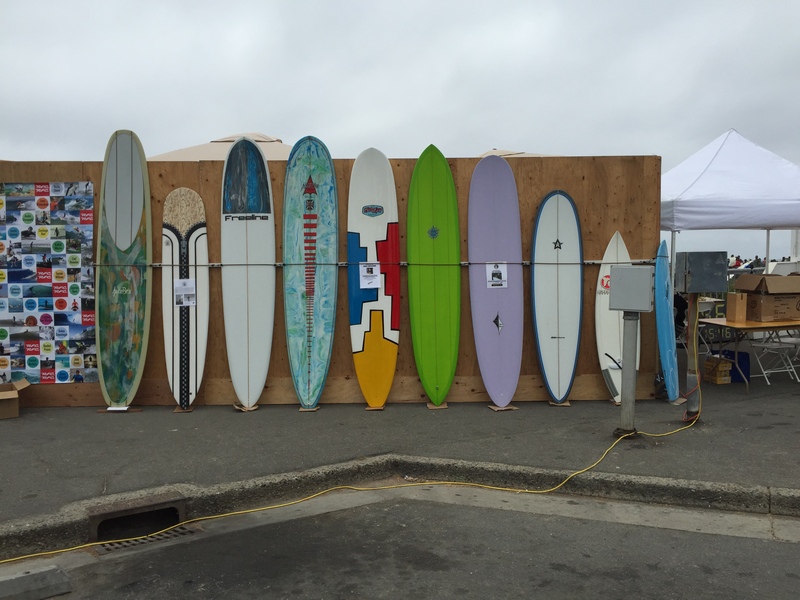 Turns out the Santa Cruz Surfing Club was even hosting a surf competition that lasted the weekend. 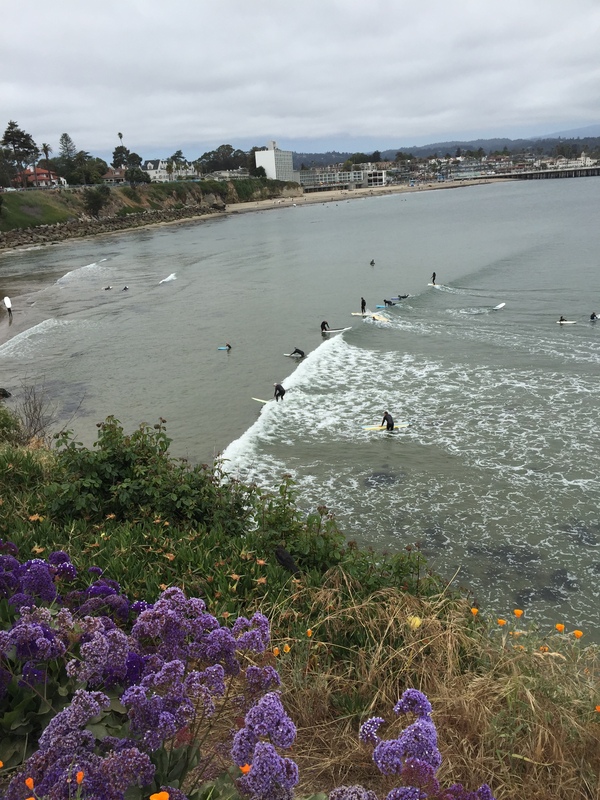 I suddenly felt like a true Californian wandering around the shoreline surrounded by people in wet suits. Even though every morning was overcast, the sun did eventually come out long enough to enjoy it poolside. 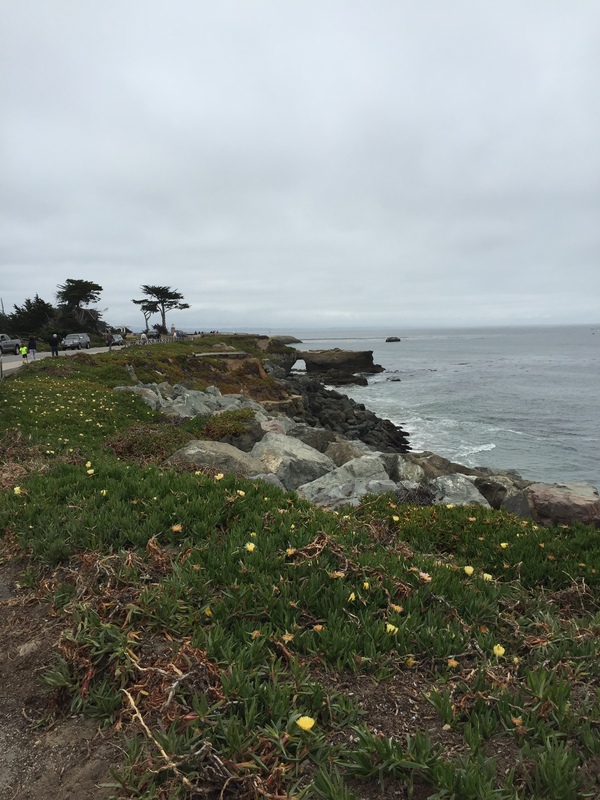 I have a special fondness for Santa Cruz since one of my college roommates and her husband relocated there for a few post-college years. Every time I found myself with a free weekend, or a little extra time on my hands, I could drive down and visit them with little or no advanced planning. I’ve come to know the town fairly well, and there are always a few places that I have to visit whenever I’m in the area. There are the beautiful beaches, of course, but also the hip coffee shops, quirky boutiques and restaurants. 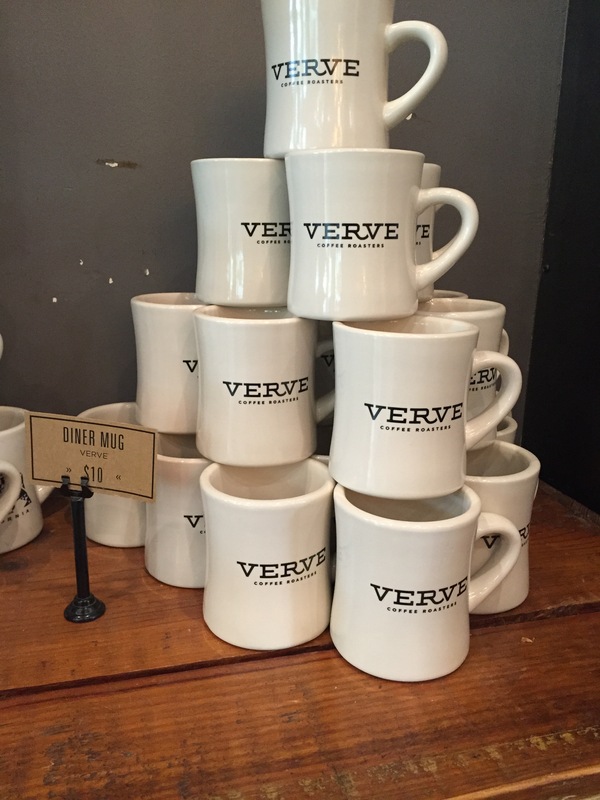 There’s Verve Coffee that, besides serving up one incredible latte, has a monkey bread in their pastry case that is so caramelized it borders on candy. Coming from someone who considers a good doughnut appropriate for breakfast, that’s saying something. My friends also introduced me to their local wine bar, Vino Prima, in their years here. Not only does this wine bar on the pier have a fantastic ocean view, but they do a mean mimosa bar on the weekends. 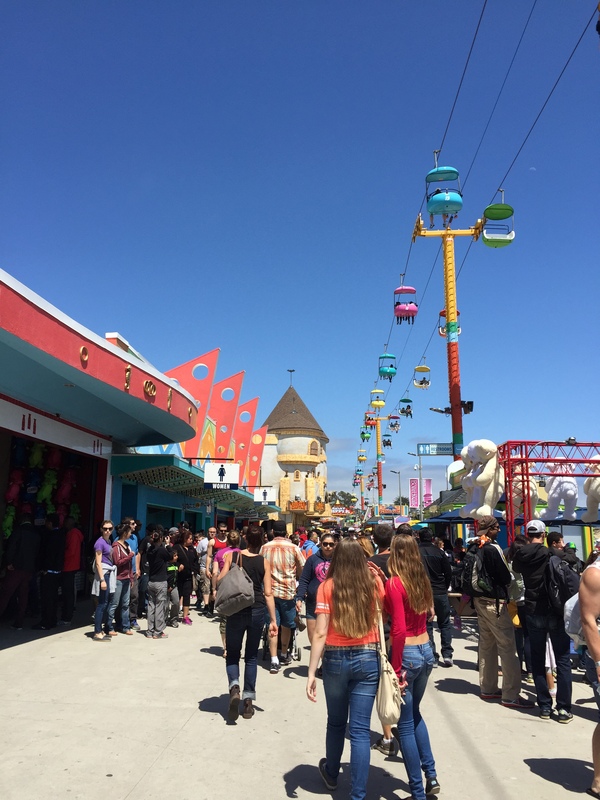 And of course there’s the famous Santa Cruz Beach Boardwalk. Despite usually being littered with tourists, it still has a certain old world charm to it. You know, the kind of charm that tells adults it’s okay to purchase things like potato chips on a stick or deep-fried oreos. I’m not sure where or what I’m pointing at in that last one. 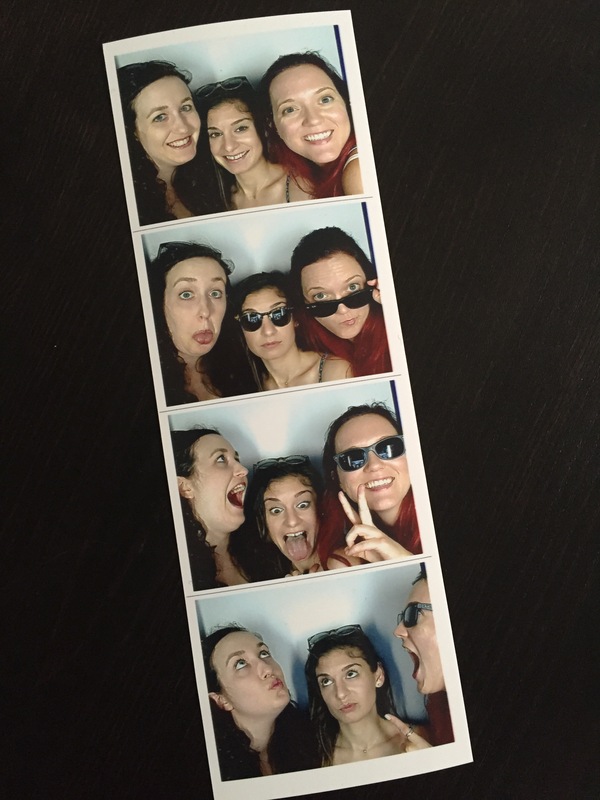 Things always seem to start normal in photo booths for me and then unravel quickly. There’s nothing quite like a beach vacation to hit the ‘reset’ button on life. Today was my first full day of work in the office, and I’ve decided to celebrate a job well done with a fresh batch of brownies. I was a bit worried about how my week would pan out, and I’m pleasantly surprised. Sure, I’m busy, but it doesn’t seem unreasonable- in fact, it’s sort of nice. I commuted by ferry into San Francisco today, which is a wonderful way to decompress both before and after work. And, thanks to my brownie adventure, I’ve also discovered another big perk of living alone: no one is around to see your batter-covered face lick the whisk. It’s one of those things you know is 800 kinds of wrong as you do it, but that certainly doesn’t stop you. Now that I’ve proven my adulthood through the course of the day (Emails! Phone calls! Unburnt dinner! ), I’m looking forward to sharing this last week’s Five Things with you, dear readers. Off we go! The last throwback photo from the San Francisco Ballet’s gala a few weeks ago. 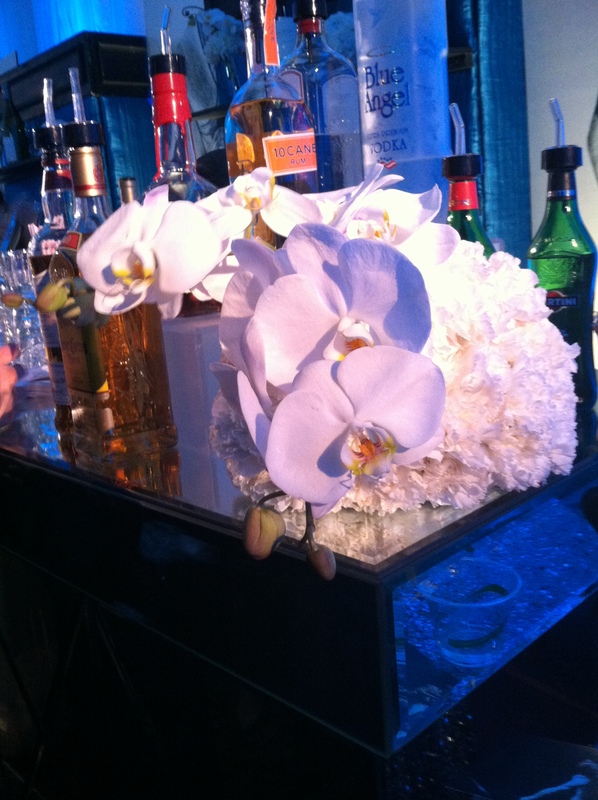 I love this picture I took of the flower arrangements adorning each bar. They guaranteed that you always had something pretty to look at while waiting for your glass of prosecco. I allowed myself one coffee break during the day, so I made sure it was a good one. 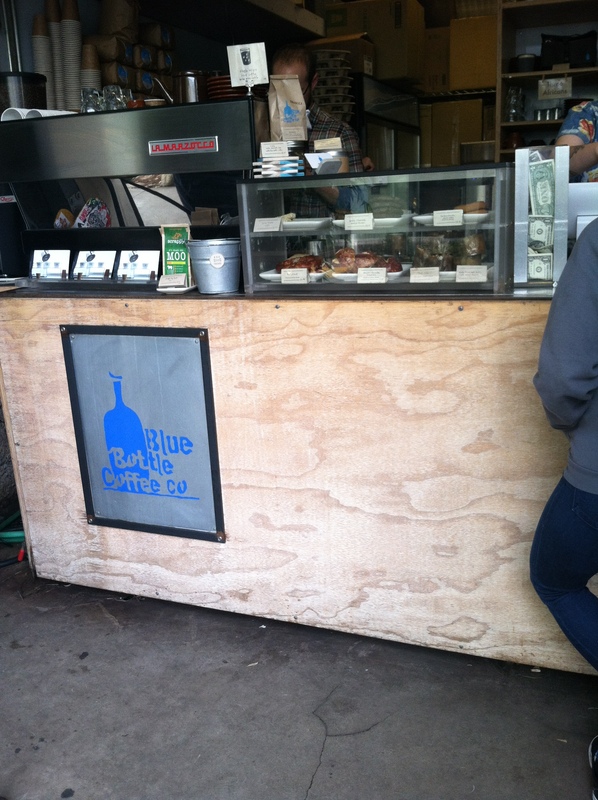 This Blue Bottle kiosk seems to have lines at all hours of the day, despite being tucked away in its own little niche in Hayes Valley. 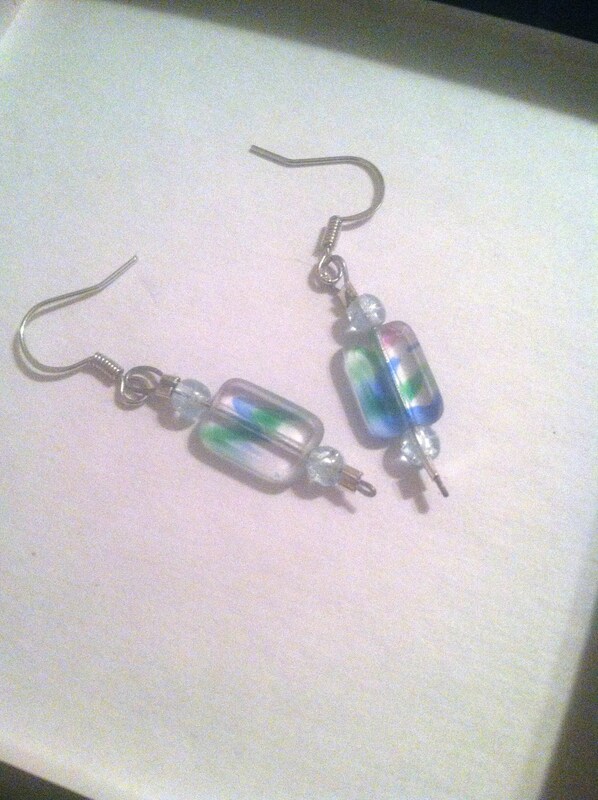 One of my students gifted me these beautiful, handmade earrings last week. 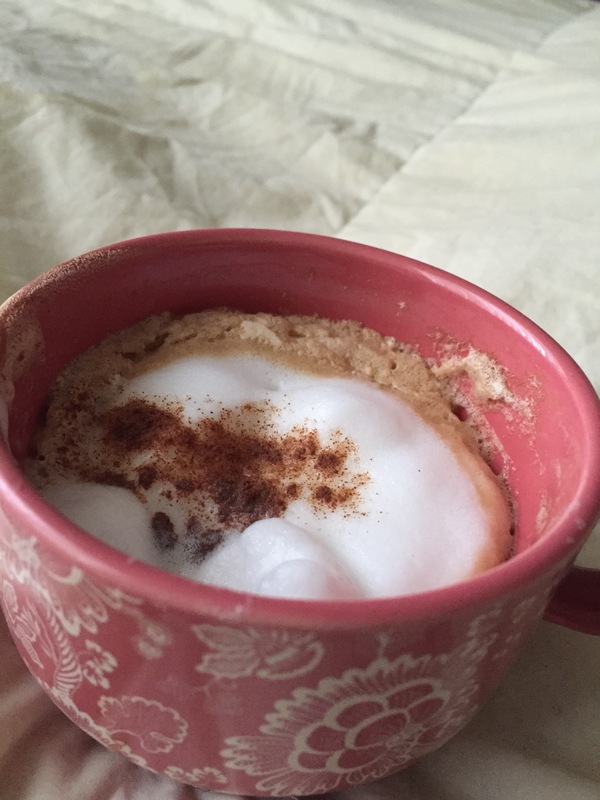 It was such a sweet gesture, and exactly what I needed when I was feeling less-than-stellar. The young dancers I work with have so much potential- I hope I’ll get to see what they’ll be doing with their bright futures. Good kids, all of them. 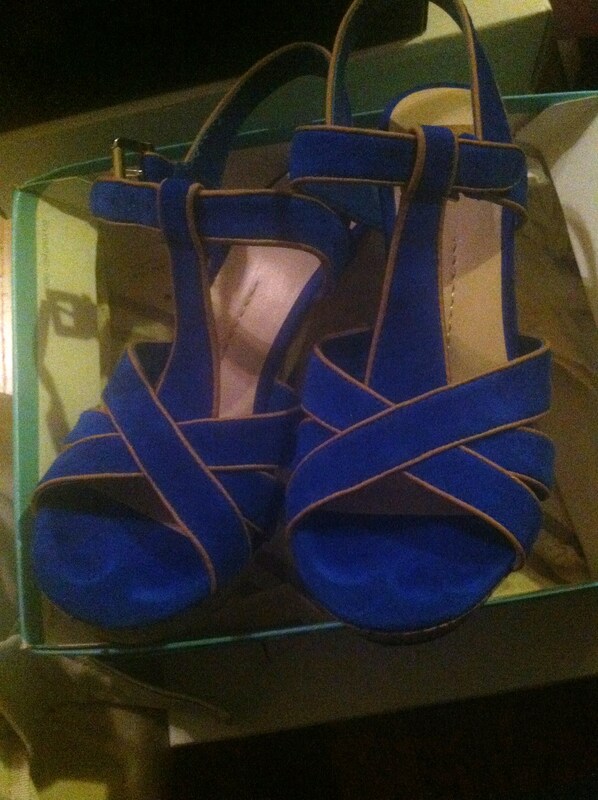 I found these new and very bright blue suede and cork wedges from DV by Dolce Vita at the local Salvation Army the other day. I took advantage of the oddly warm weather and wore them out last Saturday night with a pair skinny jeans. They made me at least a foot taller! I amused myself by hitting every crosswalk button I came across with my knee, I was that tall. I hope your weeks are off to a good start! My weekend absolutely flew by, and I’m not entirely sure how it came to be Wednesday, but there you have it. I’ve attempted to cram as much work into this week as possible, and I do think I’ve almost succeeded. 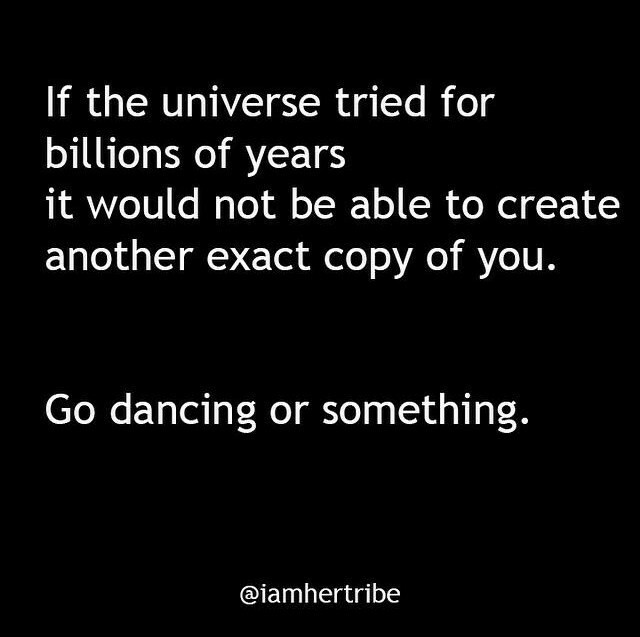 I’ve been teaching, dancing, and trying to put together a show simultaneously. Yes, it’s that time of year again: the Big Show planning has begun at my studio. This year we’re doing “The Little Mermaid,” or our version of it, anyway. It’s been one of my favorite stories since I was little, and I’m quite excited to be able to put my own creative spin on it. Because I’ve been so busy this week, I’ve really been trying to take good care of myself during my downtime. That being said, I’m planning on having a pampering, quiet evening and going to bed early in preparation for the long Thursday ahead. Remember when I said no more jewelry purchases for 2015? It’s come to the point where I’ve started stacking my rings. I’m running out of fingers, people! These are two of my favorites. 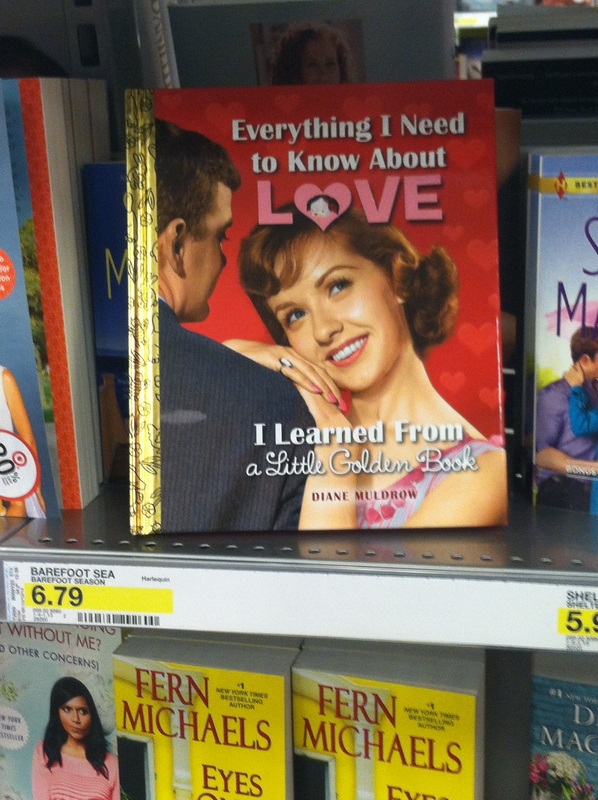 I was poking around Target the other day, and found this little book quite out of place. It felt a bit like a sign, so I picked it up and began reading it. Best. Decision. I assumed it would be horribly cheesy, but was quite the opposite. Highly recommend. 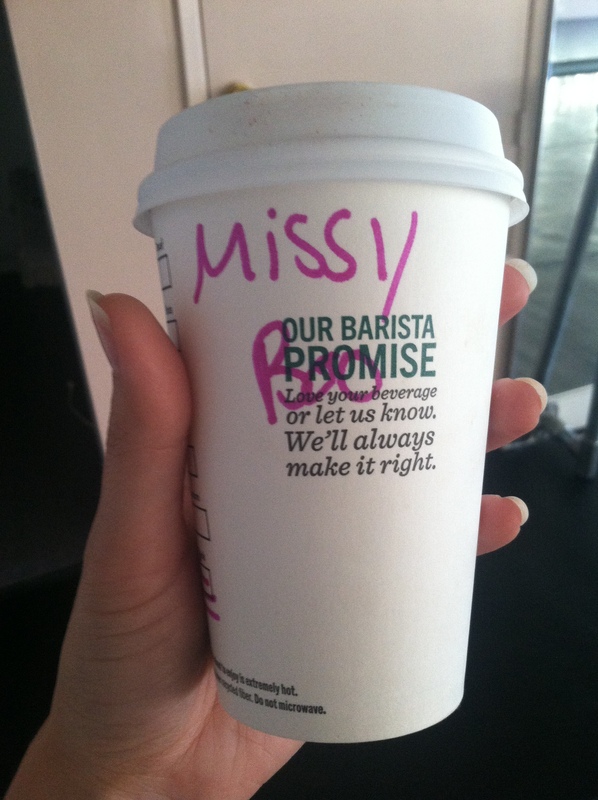 You can always count on the cute Starbuck’s baristas to brighten your day. I was joking when I told him to put this on my cup, just so you know. 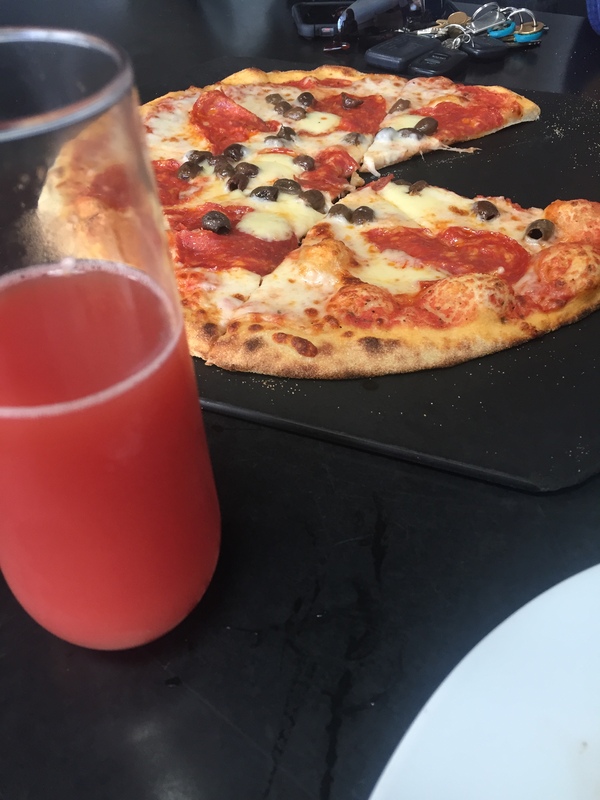 I give you the ultimate lazy brunch. I planned on taking myself out for a lazy Sunday morning, and found my neighborhood coffee shop much too crowded. Voilà! 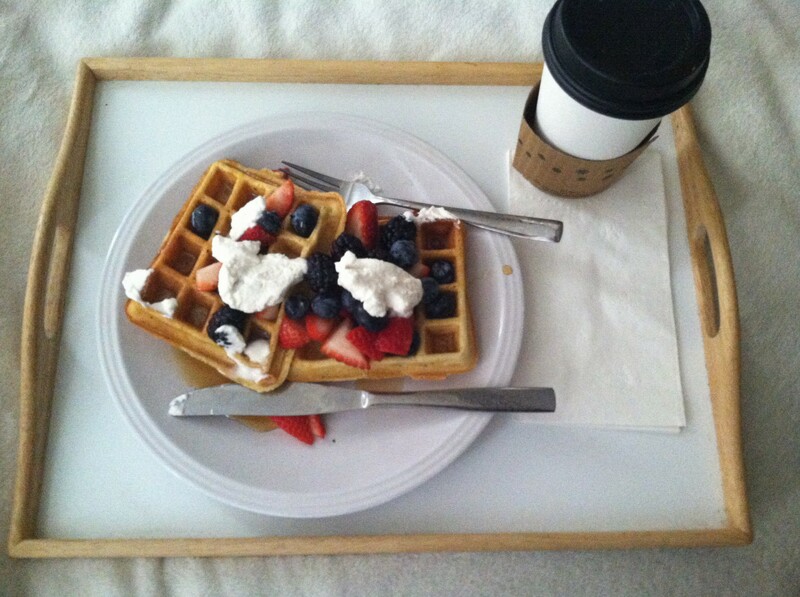 Take-out waffles. If you haven’t already seen her Nail Salon stand-up check it out here. Sometimes we just need a laugh. It’s time for the last Five Things of fall! I can’t believe it has gone by so fast, but there you have it. Tomorrow is Thanksgiving, and I’ll be on the road to my annual “Orphan Thanksgiving” celebration. Of course, while I’m no longer an “orphan” away at college, I’m so thankful that I’ve been able to continue this long-standing tradition with one of my fantastic college roommates Maren. 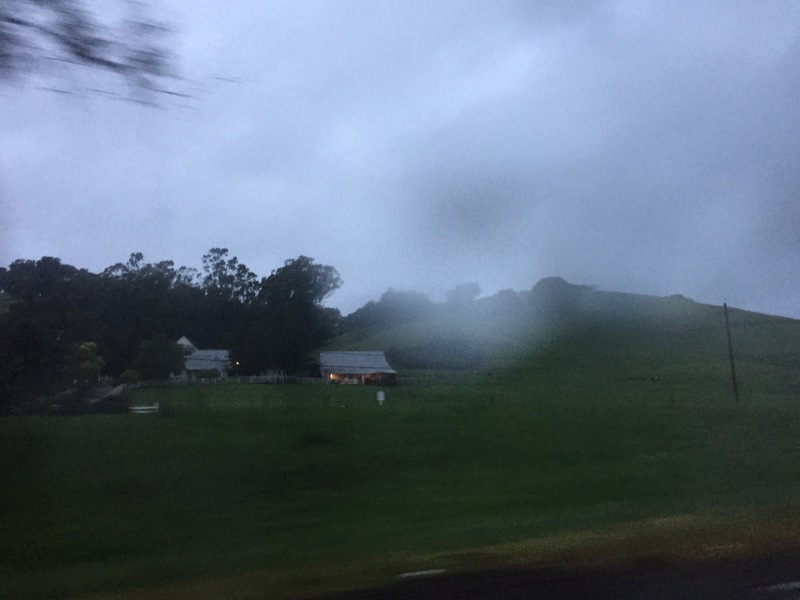 If you can recall, I did write about our lovely Thanksgiving break last year here. I can’t believe it will be little Cooper’s first birthday soon! How time flies- it has a knack for making you feel old. On to this week’s Five Things! 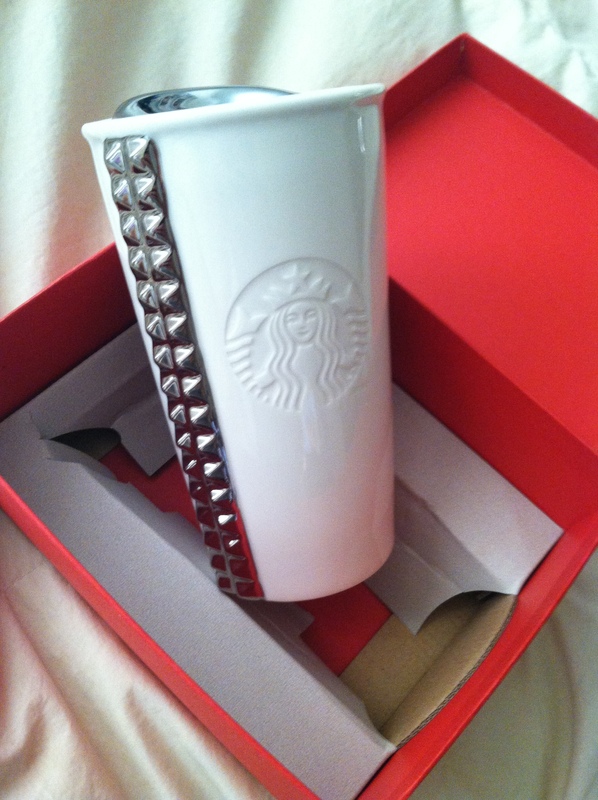 I picked up this fantastic new ceramic mug at Starbucks earlier today, since my most favorite one met its demise on the school blacktop earlier this week. Apparently, tough studs are my new thing. 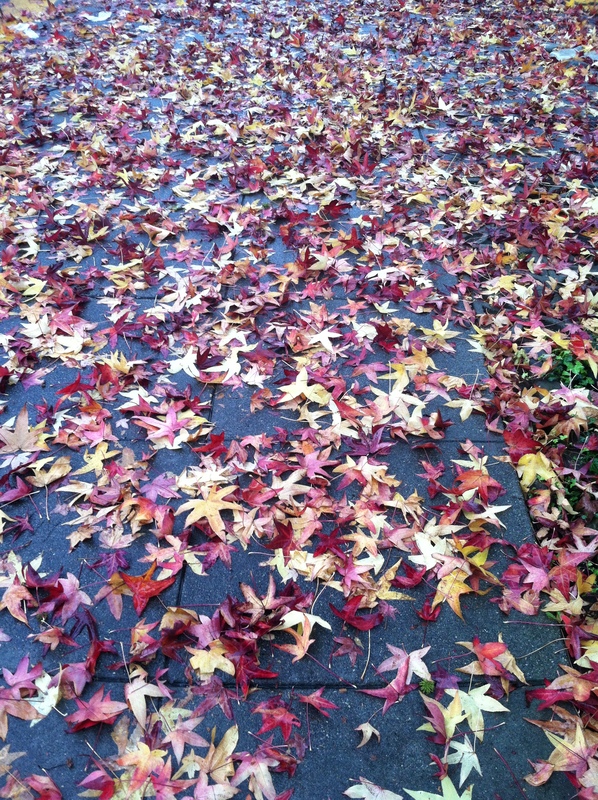 People complain that California doesn’t really have four solid seasons, but leaving my house everyday and seeing these autumn leaves scattered everywhere makes me feel awfully festive. 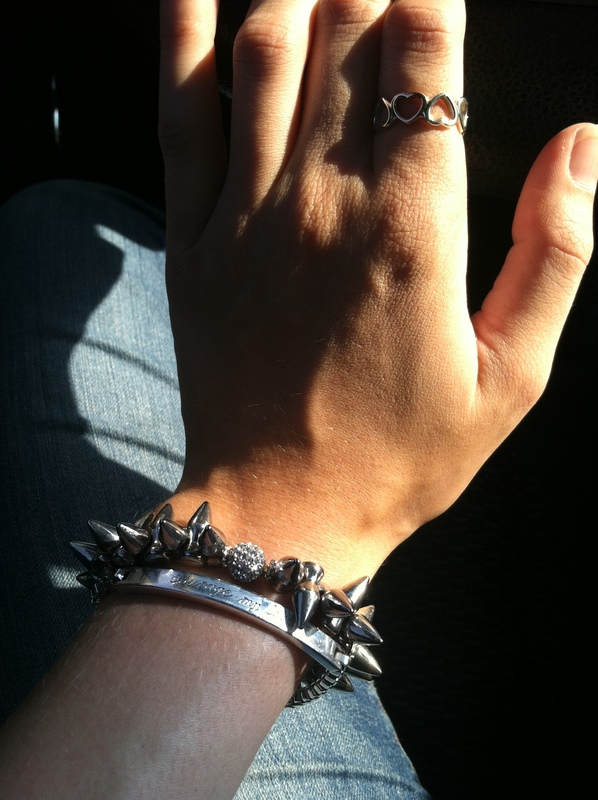 A glimpse at the jewelry I’m currently sporting. 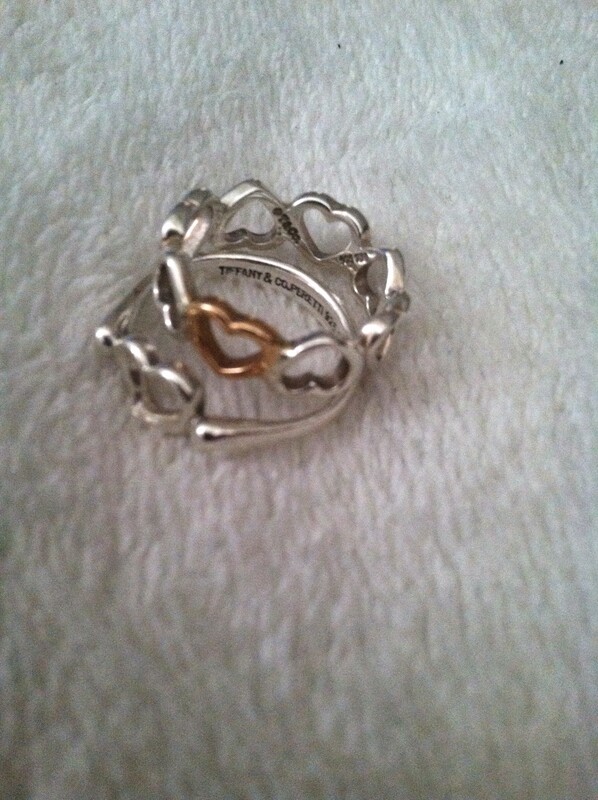 The i.d bracelet is well-loved, but the ring is one of my latest purchases. I do love it. This appeared in my text messages one day. 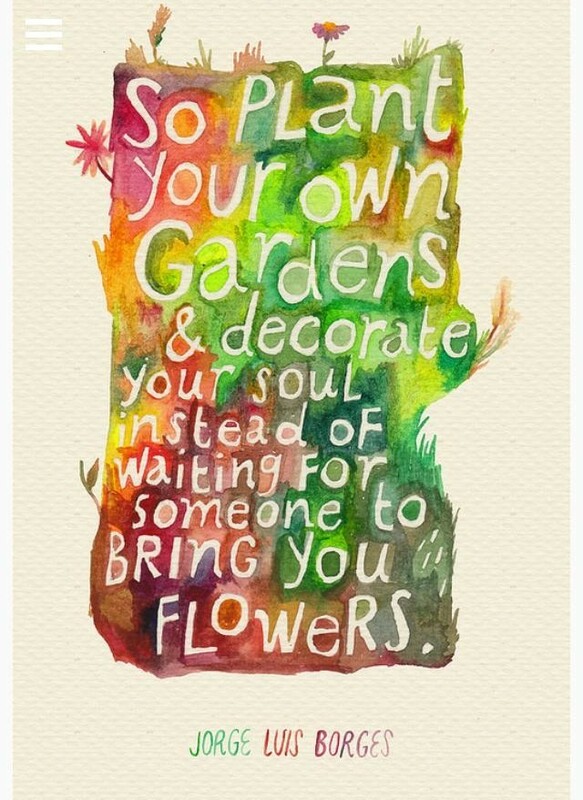 Sent to me from my friend Rachel, I thought it was beautiful both visually, and in sentiment. It’s true, you know.